A bit of a nothing day as it seems to always be when travelling in South America. Distances are huge and although the transport is good and quick it takes time. Thankfully the buses in Argentina are good with TVs, meals, huge reclining chairs, toilets and free hot drinks. We set off from Rosario after Juan had given us a small owl as a reminder of our stay in the hostel. We ended up leaving around 3pm as Juan had told us that he wanted to say goodbye to us but he wouldn’t be in the hostel until the afternoon, so we had to wait, otherwise we would have left first thing in the morning. Our next stop was Cordoba which is essentially the next city west of Rosario. Our plan was a couple of days there and then move further west to Mendoza. 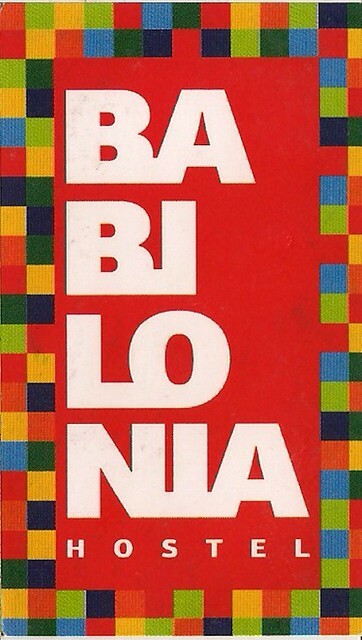 We stayed in the Babilonia Hostel which had been recommended by Juan. Last night, around 1am, Juan had called on our behalf to book us 2 beds along with a 10% discount – he said he had a deal with the owner. 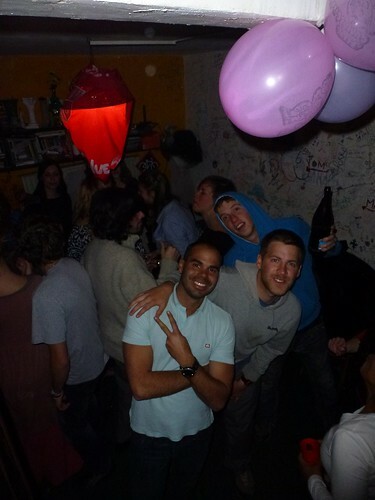 It was a really nice hostel and we met some nice people while staying there. We arrived around 10pm at the hostel so we just grabbed a drink, watched a bit of The Secret In Their Eyes, an Argentinian film which had an awesome chase scene in a football ground. Woke up this morning and the dorm stank of smelly boys, alcohol and farts thanks to the 15 boys in the room. We had some really nice breakfast which consisted of baked goods, including croissants (medialunas). The majority of the breakfast is sweet which suits John’s sweet tooth. 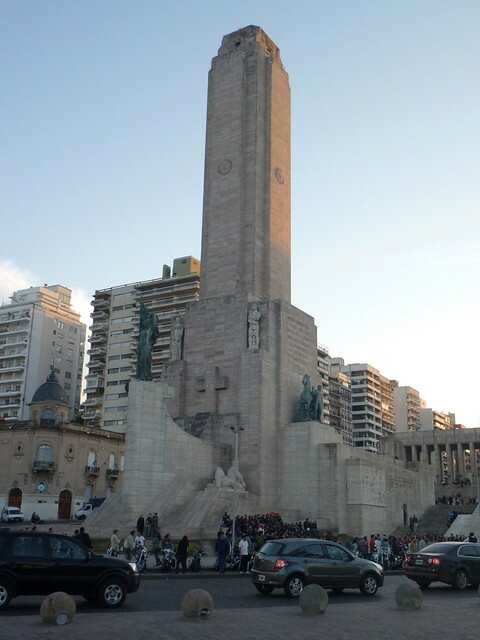 We decided we’d have a tourist day and head down the river on a boat ride and look around the monuments in the city. First up, we headed up the National Flag Memorial which stands by the river. The memorial is made up of three parts, the tower which stands at 70 metres tall, a courtyard and the Triumphal Propylaeum which is a colosseum type building. We headed up the tower, in a lift thankfully, for a great view looking down on the river, park and the rest of the memorial. 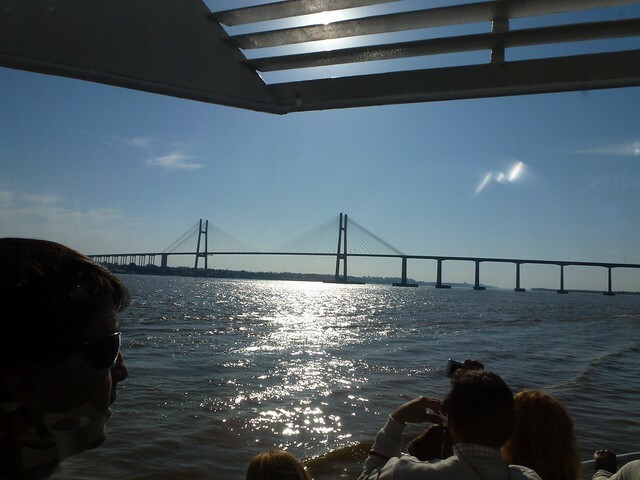 After that we headed onto a boat tour which takes you along the Paraná River taking in the sights of the river and the city. We had some drink, food, listened to the commentary and music but it became a little boring after a while. 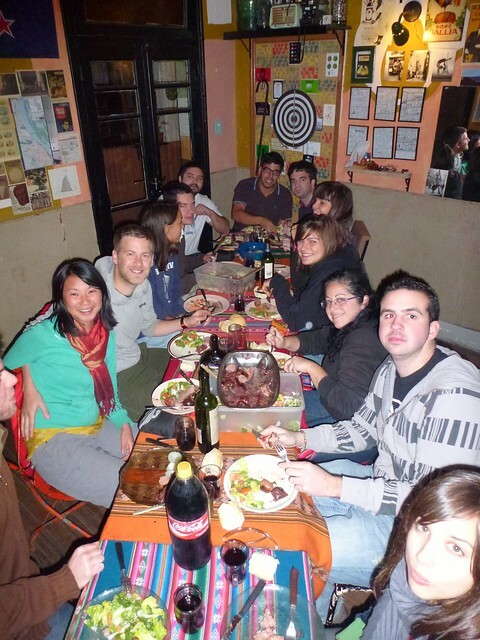 We headed back to the hostel and Juan at La Lechuza hostel had arranged an asado, a true Argentinean BBQ, for everyone in the hostel. We all headed down to the supermarket together and Juan bought all the food for us; we were there to just carry back the huge amounts of meat. Juan is a real character and he was laying into the French the whole time taking the piss out of them due to their belief of being the best in the world. Having the best wine, the best food, the finest culture, when in fact, Juan repeatedly mentioned, the best of everything comes from Argentina. 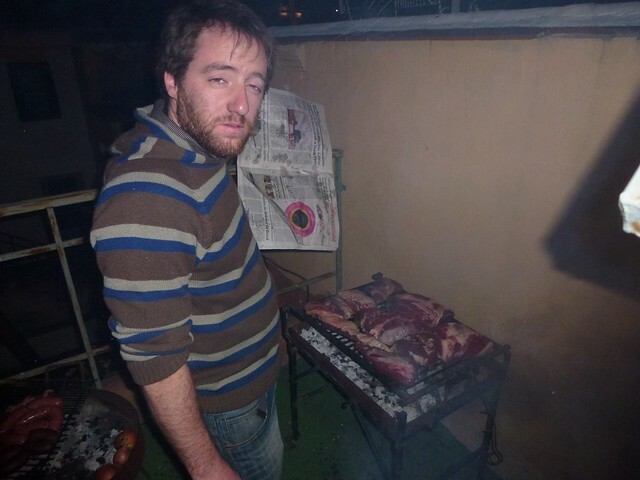 On to the meal and it was a group effort but there was only one person in charge of the asado, Juan. The entire surface area of the BBQ was covered in meat, from sirlion, to tenderloin, and skirt steak, it was amazing, good enough to eat raw. With the meal we had whole onions that have been placed on the coals (the french didn’t like them which was surprising), a huge salad, which Juan thought was a bit gay (he went on later to explain that in Argentinian society it was frowned upon to be a vegetarian, more so than being gay) and chimichurri sauce, an amazing sauce to add to any meat. And not forgetting lots of red wine! All together it cost about 30pesos each, which is about £4 for a top meal and more food than you could ever think of eating! 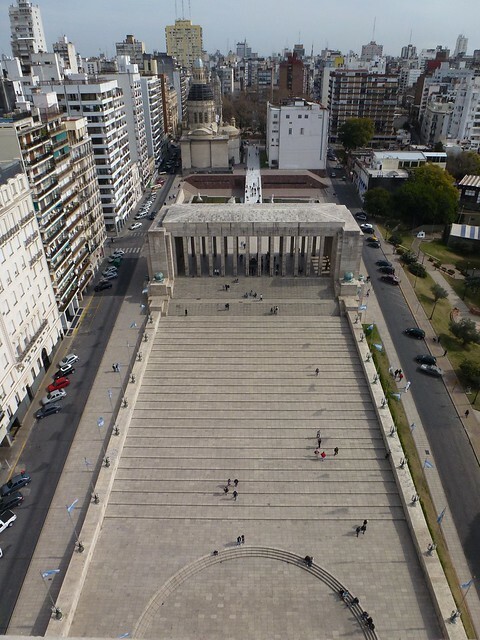 Our last day in Buenos Aries and our next location was Rosario. We grabbed the underground up Retiro where the bus station is located. We jumped on the first bus to Rosario which is around a 5 hour drive north-west of the capital. 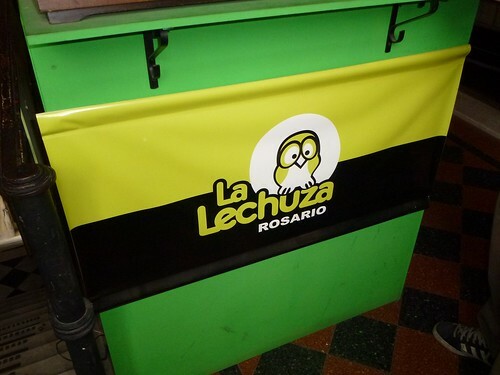 From the bus station we jumped in a taxi to the top hostel in the city, the La Lechuza hostel, Lechuza means owl in Spanish. We han’t booked for the hostel and we were greeted by the very friendly owner Juan saying that every bed in Rosario was booked that Friday night. Being near to the capital and having 80,000 students in the area the hostels get booked up quickly. La Lechuza hostel was full of french exchange students, however there was one bed spare in the 14 bed dorm. We tried to both get into a top bunk but it wasn’t going to happen, instead John was given a spare mattress and the floor at a discounted price. We had a walk around the city which is a great place to stroll around. 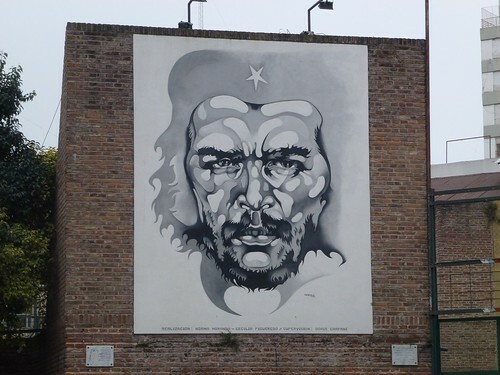 Rosario is the birth place of Che Guevara, so there’s plenty of Guevara art around the city. We headed to his birth place which was plotted on our map, however all that’s there now is a petrol station. Rosario is located along the Paraná River. Along the river banks are parks, skating areas, and walkways which makes for a great evening stroll. We headed out for a walk along the river front watching all the families drinking mate and playing in the park. It was rammed and the atmosphere was buzzing! We had a quick beer before heading back to the hostel. With just 5 hours of sleep, I got up at 8ish leaving John still slumped over in his bed – he’ll be suffering from a massive hangover after our house party last night. I just feel knackered. It’s my last Spanish lesson today and I wish it wasn’t. I’ve had a thoroughly enjoyable week and I think my Spanish has improved but guess we’ll find out in the next few weeks! I had a test, which I passed with flying colours 🙂 At the end of the lesson, we all gathered to the top floor where the “graduation ceremonies” were taking place for everyone who was leaving the school. I was up first. Alfredo came up to me, gave me a hug and a kiss before presenting my certificate to me. Then it was photo time and everyone applauded. It was a bit surreal and funny at the same time. My classmates also came to support me. Me and Alfredo, my teacher. I am also holding my certificate which in hindsight I should have probably held up for the photo. Oh well. We then all went out for lunch. John had meant to come and meet us for lunch too but he didn’t turn up so I guess he was probably still in bed. We went to a little cafe and I had a massive chicken sandwich with chips. After saying my goodbyes to everyone 🙁 I walked home with irish John for the last time. I definitely want to keep in touch with everyone. When I got back, John was still in bed. With me “graduating” and our last night in Buenos Aires, it would have been nice to do something tonight. Instead, we went to a really crappy all you can eat chinese/meat restaurant then headed back to the hostel as John was still struggling. 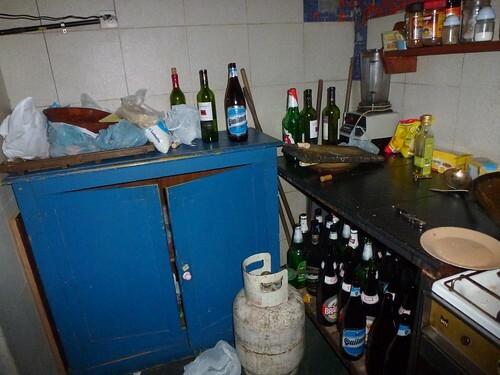 Day 61 – House party in BA! It’s my penultimate Spanish lesson today. I’m really enjoying plus my classmates are great and we all get on. We laugh so much in class. The highlight today was when Jack said ” After dinner, I talk to my potato”. He had meant to say “After dinner, I talk to my father” but he pronounced father without an accent on top of it changing the word to potato. Funny stuff! Everyone in my class is learning for longer than a week so I will be the only one leaving tomorrow which is a bit sad. If I had travelled on my own, I would have almost certainly have extended my time at ExSpanish by at least another week but this would be a little unfair now with John. We’ve almost spent 10 days in BA, the longest time we’ve been in one place since we’ve been away and it’s actually quite nice not having to unpack and move all the time. I also explained to Alfredo my trip to the bank and in the end he wrote on a piece of paper everything I needed to explain what I was looking for so all I had to do was turn up and show it to the guys at reception. So I did that after class had ended. They sent me to the second floor. The guy had no idea. I was then sent to the fourth floor who then sent me back down to the second floor. In the end they told me to go next door where HSBC Premium was. They let me use their phone to call customer services in the UK. Finally, it was decided that they would send it out to NZ to John’s Auntie’s address in Hamilton. We would be there in September so it would mean a couple of weeks without internet banking. I didn’t go to any extra classes in the afternoon so I just returned to the hostel to find John and Lambert just chilling out. We also met another guy in our room who apparently had been living in a house just down the road with students for 2 months but he moved out as he couldn’t think or arrange his future travel plans because it was too much of a party house. So he had moved into our dorm to get away from all the parties so he could plan his trip. But tonight, they were throwing him a going away party which he invited us to. With my Spanish test tomorrow, I decided to go but not drink too much. We bought a big bottle of cheap fernet and a bottle of fake coke to mix it with. We turned up around 9pm and they had just finished eating dinner and then all the party lights came on. The music started booming and everyone was dancing away. It was really good fun. But by about 1.30am, John was out of it. I was also drunk by now and he wanted to leave and I wanted to stay. In the end, I could see that John needed to go home. Lambert decided to leave with us. We managed to walk back just about. When we got back to the hostel, John, who had the top bunk, was struggling to get into bed. He was almost there then he literally fell on top of me. Then he said he wanted to puke so off we went to the toilet. It went everywhere and it was all black (from the fernet). What a disgrace but it happens to the best of us. The amount of times John’s looked after me when I was out of it means that I can’t complain when it’s him. I was finally in bed by around 2.30am with around 5hours of sleep until my alarm goes off!